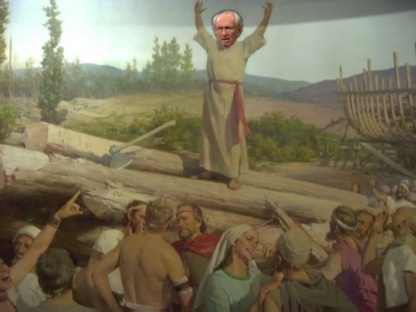 Add your own captions to "Hinckley Noah Prophet" in the text box below. What do you mean it is not scientifically possible to fit all the species on earth into this boat!? God has commanded that we build a floating temple that we might take the blessings of temple work to the people of the islands of the sea! I am building this ark out of a tree that I planted in my yard as a young boy. It started as a tiny acorn and grew into a mighty oak. So I cut it down. The Lord has shown me a vision that God will destroy the Wasatch front with a giant Tsunami that will lift this ark and cary us to Jackson County Missouri. Crowd: What's "I don't Knoah anything" building now? I Don't Knoah: Its called a love boat. We will swap each others wives and sail around and party. Construction Manager Hinckley demonstrates anger at anger demonstrated by stake members at being told they will have to fund costs of new ark, already under development, "and to hell with the attendance numbers! I testify to you that if we build them, someone will show up. It might be the same three people all of the time, but someone will show up!" President Gordon B. Hinckley today demonstrated the latest in Mormon temple construction technology to the Annual Convention of the Southern Baptist Convention.